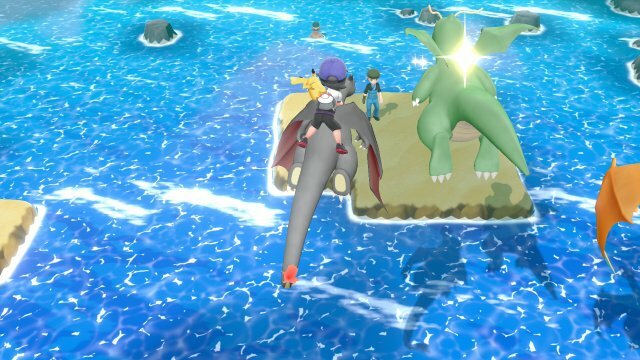 While riding Pokémon is a thing throughout the game, after you beat the Elite Four and become the champion, a whole new realm opens up. 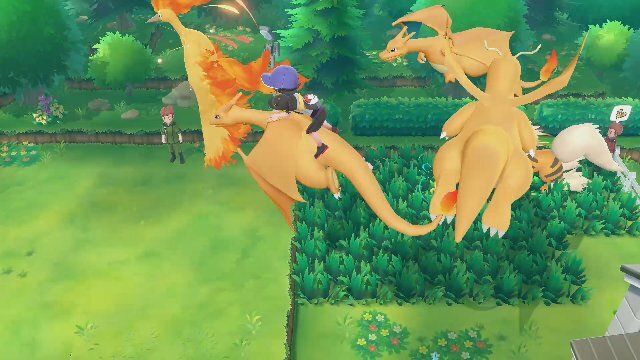 From then on, you can fly up into the sky in the routes and cities of the Kanto Region by riding on Charizard, Aerodactyl or Dragonite. When in the sky, you can fly over buildings, obstacles and water, but can't fly over gates between two routes. This originally was briefly showcased if you had the Pokémon in Route 17 but now works for the whole region. However, there's more to this feature than just ease of travel. When in the sky, there are various Flying-type Pokémon to encounter. Typically these are either Pidgey, Pidgeotto & Pidgeot, or Spearow & Fearow depending on where in Kanto you are. However, like the rest of Kanto, there are rare spawns that increase when you boost up your Catch Combo. Typically, this is just the spawns of Charizard and Dragonite, but very rarely you could encounter the Legendary Birds. To encounter wild Pokémon, you just need to fly into them with the Flying Pokémon, but if you don't have one then another Pokémon does work. If you ride an Onix you will be able to reach the wild Pokémon for encounters.